Some criminals are so habitual that Spokane County judges recognize them when they first appear in court after their arrest. In an effort to stop the spinning of what some say is a revolving door at the Spokane County Jail, the Spokane Police Department has launched a “chronic offender unit.” The new unit targeted the top 20 residential burglars – those with multiple charges – for intensive tracking and services designed to help them break their addictions and find housing and jobs. It launched in March with two officers and has already been expanded to three officers and the top 31 offenders, said unit commander Lt. Tracie Meidl. “We wanted to focus on something that was measurable,” she said. Each of the offenders involved in the program, which includes several juveniles, agreed to participate. The premise is simple: Police keep track of the offenders and offer them help with whatever they need to get their life on track. If the offender refuses or doesn’t cooperate, police work with prosecutors to ask for high bonds to keep them in jail. The unit is patterned after one in Vancouver, B.C. Since it began in 2004 there has been a reduction in property crime and an increase in jail sentences for those caught committing property crimes, according to a 2008 report. The Spokane officers assigned to the new unit traveled there for training. 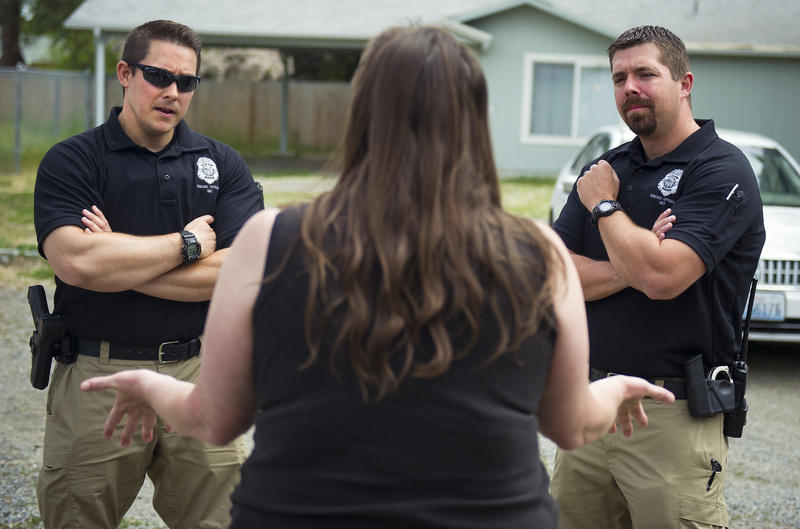 Spokane’s new unit was greeted with suspicion; many offenders worried that police were just trying to pin more crimes on them, Meidl said. “The way we’re working with offenders isn’t anything like what they’ve seen from law enforcement before,” she said. But on the whole, the chronic offender unit has been well-received, Meidl said. Many of the offenders have similar stories, said Officer Kyle Yrigollen. They generally started their life of drugs and crime young and in some cases were following in the footsteps of their parents. The intent is to work with each offender for about a year, he said. Working with an offender and making sure they’re following through is time-intensive. Right now the unit works with people convicted of nonviolent crimes, who are not supervised by the Department of Corrections once they’re released from prison. Police first have to determine whether an offender is serious about getting help or just saying what they think police want to hear, said Officer Jake Willard. But given their unit’s relatively low caseload they are able to check on the offenders regularly. During one recent day, Yrigollen and Willard drove to a home of a man in their caseload. He got a job and seemed to be cleaning up his act, but he didn’t show up for an appointment with the officers that day. His girlfriend answered the door and said he was at work. But when the officers checked, his boss said he hadn’t shown up for several days. From there they visited Tracy McClure, the mother of another offender who also had been making progress. The 22-year-old had started hanging out with old friends, however, and was picked up on a minor charge. McClure told police her son wasn’t living with her anymore and was staying with friends she didn’t know. He also hadn’t been looking for work like he’s supposed to. “I’m glad you guys are willing to help him, but he has to be willing to take the help,” she said. Her son had six convictions in 2013 alone. Officials say it’s difficult to know how effective the program has been after only a few months, but department crime statistics show that residential burglaries were down 31.5 percent from Jan. 1 through June 14 compared to the same period last year. “I think what we’re doing is working,” Meidl said. If she can get more officers assigned in her unit, Meidl said she’d like to focus on prolific car thieves next. The chronic offender unit’s work will pair with a new “civil enforcement unit” expected to be up and running in the fall. That unit will focus on cleaning up problem properties by working with landlords and seizing assets that can be traced back to criminal activities. The officers in the chronic offender unit know that not all the offenders they work with will get on a law-abiding path and maybe only a few of them will.